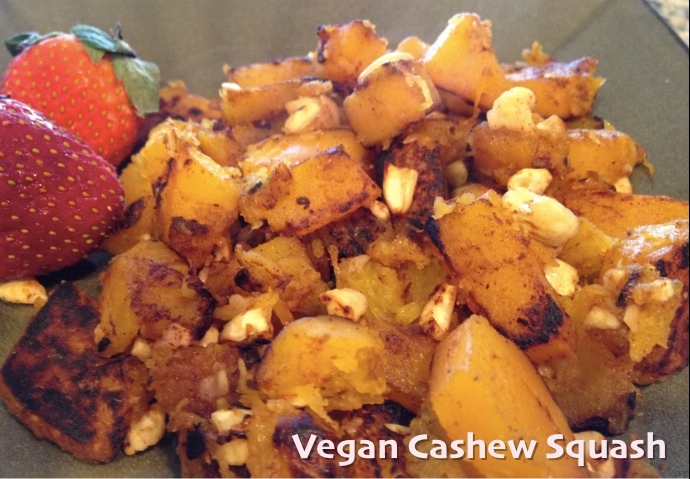 Vegan Cashew Squash – a nutritional powerhouse, clean start to the day! A little while back I posted a recipe that I make for breakfast which includes sautéed butternut squash, spinach and bacon. Since I avoid eggs to follow the Auto-Immune Protocol diet, and can’t eat grains, my breakfasts are typically leftover dinners or a juice smoothie. But sometimes I don’t quite feel like leftovers, and crave something warm, meat-free and fire-y in my belly, so I love this butternut squash recipe! I’ve adapted this dish to leave off the bacon and spinach, and add in slivered cashews with a touch of cinnamon, which makes me feel like I’m eating a more traditional, semi-sweet breakfast food. The easiest way to make this as a quick meal in the morning is to have already pre-baked your squash. To do so, cut the squash in half, length-wise and bake flesh side down on 375 for 45 minutes. Remove and let cool, storing it in the fridge for up to a week. Try this one – you’ll love it! « Feb’s first giveaway: Caveman Feast, a Paleo Cookbook with more than 200 amazing recipes!